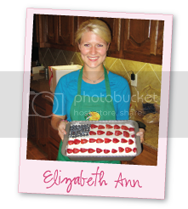 Elizabeth Ann's Recipe Box: Branch out. . .
7 Branch out. . . I have talked to a couple girls in the past few days who don't cook. . . I think the underlying theme of both conversations was "I don't want to be a failure." This is on my heart today. . . what is something that you could branch out and do?? Something that you might not think you are very good at. . . something that seems difficult or hard? I was always athletic. . . I run, I love to swim, wakeboard, play sports, etc. . . I might not be the best/fastest at any of the above, but I enjoy it and sports came relatively easy to me. . . "working out" did not. . . I hate working out in a gym because I adore running outside in God's creation. 2 months ago I couldn't do a "real" push up if you paid me. . .
and then I started doing Crossfit. On our workout on Memorial Day, I did 100 (real) pushups. . . I THOUGHT I was in shape because I ran. . . but I literally could not walk the day after I went to Crossfit for the first time. . . but I stuck with it. . .(even though it was SO hard). . . and now I have something to show for it! So what have you been wanting to try??? What do you think your not good at??? If it is cooking. . . well. . . go to your local farmers market this Saturday. . .
Have fun picking fruits and vegetables out. . .
Then come home and make a fruit salad (just cut up fruit and put it in a bowl together) . . . and THERE . . . you did it! You made something in the kitchen. . .
Then you can start to do more when you feel confident. 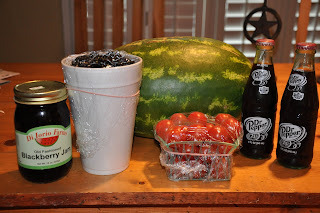 . . make a watermelon, tomato and cucumber salad or bread some chicken. . . pick things that are easy with just a couple ingredients. . . So. . . what are you going to branch out and do this weekend??? Ok...this is SO funny even though I just wrote you three facebook messages, I had to write a comment here too. Thanks for the inspiration both with cooking and working out! (Although Tuesday I think I heard Michael say he would go to Jack in the Box.) Thanks for giving me the courage to try something new and fail, that is a refreshing thought! What farmers Markets do you rec? I'm one of those who is afraid to cook too because I want it to be perfect the first time. So I just never try. I'm glad I read this today. Decorate. I have been surrounded by amazingly talented women with interior design skills to die for the last 12 years, so I finally set aside the time and funds to update our home. So empowering to do something you once thought impossible! I absolutely agree with you!! Baby steps. I did not start cooking and writing recipes until I was 25.